Never mind! I discovered the problem: I had been using radio buttons instead of checkboxes! I can’t find out how to do this. When I click on +New “Other” N/A Etc. I get the option of adding all of the above or none of the above but NOT “Check all that apply” (that is, ONLY the ones that apply). 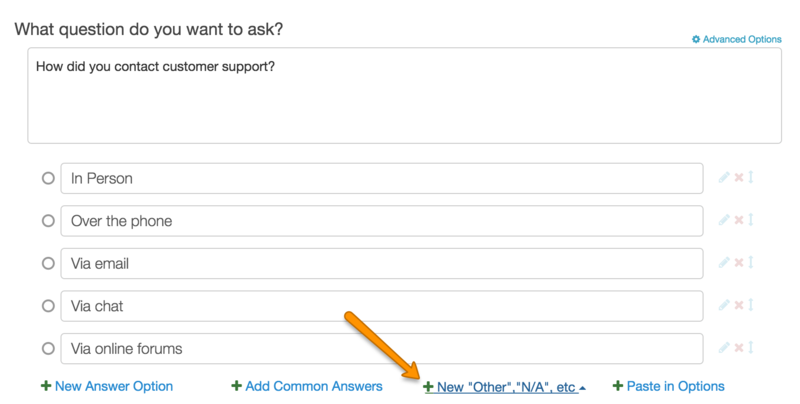 And the “+new “Other…” box doesn’t even appear when I try to edit a question with a list of checkboxes in a previously created survey. But in that survey, when someone clicks on one check box, if she then clicks on a different checkbox the first one is Unchecked. Please call me at 303-589-7107 or if you can’t do that, email me at Drk@Drkonline.com and tell me how I can create a list of checkboxes that allows people to check as many as they like?